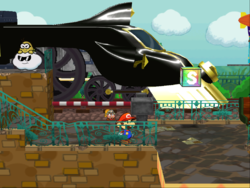 The Excess Express is a luxurious train which is boarded by Mario and his partners, to get to Riverside Station and Poshley Heights in the game Paper Mario: The Thousand-Year Door. It, as well as the smaller areas Poshley Heights and Riverside Station, serves as the setting of Chapter 6 of that game. The Excess Express is made up of a locomotive, three passenger cars, a dining car and a baggage car. End scene showing Pennington inside of a passenger car. The Excess Express has an article written about it, by the RDM (Rogueport Direct Mail Service), saying that the Excess Express workers gang-tackled a train-obsessed Lakitu who was in a worker-only area, making the train late for the first time in ten years. The Excess Express allowed him to leave with just a warning. After defeating Cortez and Lord Crump, the Magical Map leads Mario and his Partners to the Poshley Sanctum in Poshley Heights, where they will find the Garnet Star. Like Glitzville, Mario needs a ticket to get to the Excess Express, which Professor Frankly says is the only way. After doing Don Pianta's workers (Tony and Vinny) a favor (finding Don's daughter and her boyfriend), Don gives Mario an Excess Express Ticket. While on the way to the station, Beldam appears and thanks Team Mario for saying that the next Star is in Poshley Heights. Either way, they advance to the station, knowing they must reach the Star before the Shadow Sirens do. During the three-day train ride, many unfortunate events happen, forging the premise of a whodunit novel or film and hindering Mario and his pals by keeping them from getting the sixth Crystal Star. Heff T. steals Chef Shimi's Galley Pot, and Doopliss (impersonating Zip Toad) steals a Businessman's briefcase containing ingredients for Nitro Honey Syrup, the waitress's Shell Earrings, and Toodles's Gold Ring. Under orders of the Shadow Sirens, he planned to mix the things he stole together to bomb the train, resulting in what he described as a "sticky, yummy explosion" in the threatening message he left in Mario's cabin. Mario and his friends enlisted the help of Pennington to foil his diabolical plans, and in doing so, returned the stolen items to their rightful owners. Mario and his partners also met Ghost T. here. Mario had to talk to him after the Excess Express conductor accidentally left him a blanket (not realizing that he was a ghost), leaving the conductor without a blanket of his own. Mario had to retrieve Ghost T.'s diary for the ghost to get him to give the blanket back. If Mario reads the diary, he will get an instant Game Over after a small cutscene. Mario and company also run into a massive horde of miniature Smorgs while the train is being refueled at the Riverside Station. After the Shadow Sirens' sticky bomb plan was foiled, they ordered the horde to guard the drawbridge switch to keep said bridge lifted and prevent the train from progressing any further. After Mario and company venture inside the station, fend off the horde and lower the drawbridge, the train is able to continue on, but little do they know, as the train left the station, the horde stowed away in the baggage car. The next morning, the horde attacks the train and kidnap all the passengers onboard, with the exception of the engineer, the shopkeeper, the conductor and the waitress, the latter two of which they hold captive in the baggage car. Mario and his team climb up to the heavily Smorg-infested rooftops of the train and fight the horde, eventually freeing the passengers and saving the Excess Express. Afterward, the rooftops (and the baggage car, for that matter) are inaccessible. Below is a list of the occupants of the eight cabins of the Excess Express. With the exception of Mario, Ghost T., and Heff T., all occupants are replaced by various traveling Toads, Koopas, and Goombas after Chapter 6, listed after the forward slash. 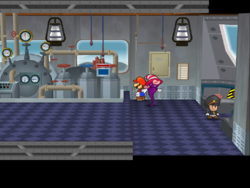 Other characters found on the train include the engineer, the waitress, Chef Shimi the cook, the conductor, as well as a red Toad who runs the shop. After completion of Chapter 6, a single Yoshi also can randomly appear in the kitchen cabin, the only one in the game other than Mario's Yoshi partner and his Stampede friends. Additional items are on sale at the Sales Stall item shop in the dining room. Autograph Given by the engineer while doing Bub's favor. Blanket Given by Ghost T. when returning the Ragged Diary to him. 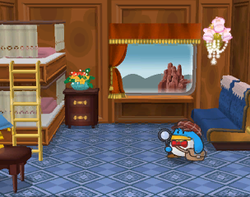 Briefcase Given by Doopliss as Zip Toad. Later Mario returned it to the businessman. Dried Shroom In cabin 005, it's left by someone inside the drawer. Galley Pot Found in Heff T.'s drawers after checking the foorprints. Gold Ring Given by Doopliss as Zip Toad after he is caught. Ragged Diary In the storeroom. Mario gives this to Ghost T. in Chapter 6. Shell Earrings Given by Doopliss as Zip Toad after he is caught. Given by Bub during the events of Chapter 6. Star Piece In the engineer's room, it's under a panel in front of the gauge. In cabin 004, it's under a panel in the southwest corner. In the dining room, it's given by Chef Shimi when returning his Galley Pot. In the dining room, it's given by the waitress when returning her Shell Earrings. In cabin 008, it's found in the drawer. Vital Paper It's found in cabin 001 after Businessman's things are stolen. This is a passenger car. Orange and brown decor... That actually looks good! the passenger cabins here are numbered 3, 4, and 5, in case you forgot your numbers. This is a passenger car. The green and brown colors actually work here. Wow. There are two passenger cabins here, numbers 1 and 2. This is a passenger car. The blue and brown interior here is totally chic. The passenger cabins here are numbered 6, 7, and 8. ...But you knew that. This is the engineer's car of the Excess Express. Any kid would LOVE to see this! Look at me, Mario! I'm an engineer! WOOP WOOOOOP! Hey, but driving a train is really nothing to joke about. I totally respect engineers! This is the freight car. Usually, passengers aren't allowed back here. Looks like there are lots of bags here, ready to be unloaded at the next stop. This is the train's roof. Look at that scenery go whipping by! Wowser! ...Look, this is no time for me to be describing stuff! These guys are so ANNOYING! They're flippy and floppy and gross and I HATE them! Let's get rid of them! During the events of Super Paper Mario, Francis writes about wishing to buy an Excess Express train set. Ghost T. does not notice the Smorgs attacking at all if Mario talks to him while they are at the train. The Excess Express has the most music tracks in the game, with there being a total of eight (one each for day, dusk, and night, one as the track for Pennington, one as the music played for Ghost T., one for Riverside Station, the music played when the Smorgs attack the train, and one more if counting the lack of music for the baggage car). In the photo of Zip Toad in his Email, one can see Jr. Troopa flying outside the window. A train similar to this appears in Captain Toad: Treasure Tracker, in the stage known as Blizzard on the Star Express. This page was last edited on December 8, 2018, at 08:22.